This is the first time I’ve played through Bioshock. Like many of my peers, I am familiar with the premise of the game, and I’ve seen people play it before. That said, the game exceeded my expectations completely and in light of our readings and discussions in class, sucking me in and messing with my mind after barely an hour of play. At the beginning of the game, I was given very limited information about what was going on. The first moment I felt “trapped” in an elevator, with a mutant human cutting its way in and screaming at me, I felt a very human emotion of despair. As I would continue to play, this would happen multiple times. In terms of Johan Huzinga’s “magic circle,” I believed in the “magic” of this game after just 10 minutes. I felt powerless, but in the best kind of way and only for a brief moment. That brief moment set the tone for the next hour, and started off my experience on a strong, ominous note. The horror elements of this game are pervasive and relentless. As soon as I had the freedom to move around as I wished, I was practically forced to notice the seedy and demented nature of the areas I moved through. The climax of this experience was during the Medical Pavilion level. I entered a room (pictured below) with three portraits of women on the wall, a bloody table with roses on it, and a cursive note on the ground reading “ABOVE ALL, DO NO HARM – J-Steinman.” From then on, I found notes, journal entries, and ex-patients of the doctor who would attack me. His writings compared the mingling of ugly people amongst the beautiful with the mingling of the criminal amongst the lawful. This kind of perverse and fascinating logic served to improve my experience playing the game, adding another dimension of insanity and terror to the already-horrific level. 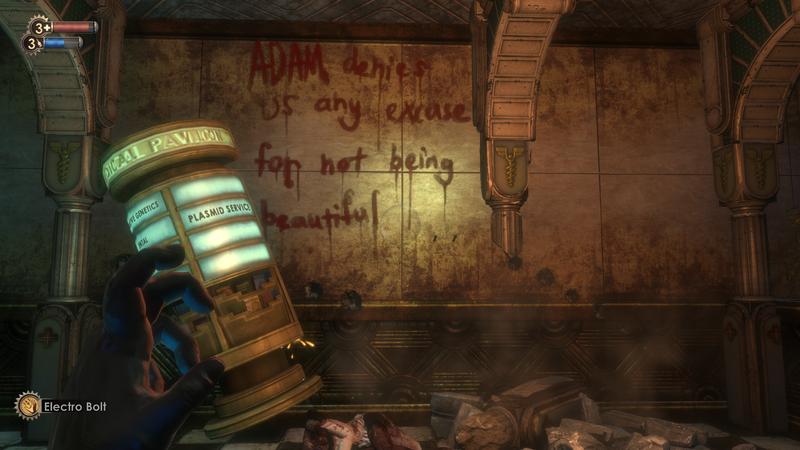 The beauty of Bioshock is in the nature of the gameplay. Roger Caillois writes that “An outcome known in advance, with no possibility of error or surprise, clearly leading to an inescapable result, is incompatible with the nature of play. 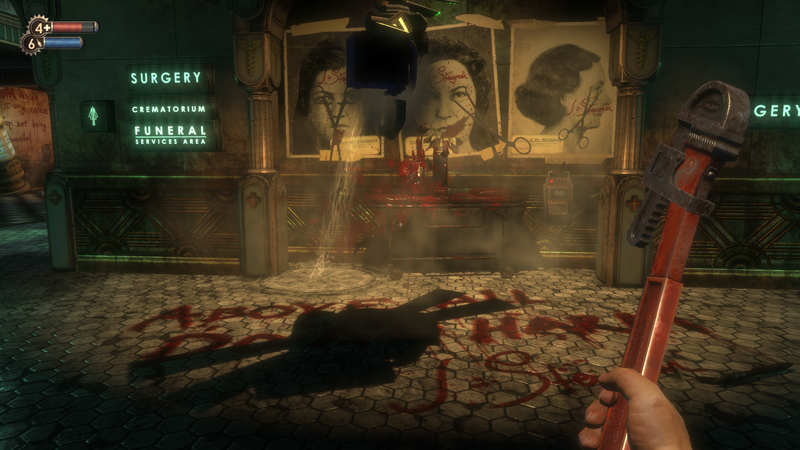 Constant and unpredictable definitions of the situation are necessary…” which Bioshock captures perfectly. In the scene where I was trapped in the elevator, I felt afraid and believed the mutant would break in and attack me, but it ran away at the last second. Later, a Big Daddy walked past my semiconscious body, and I knew that I could not stop it. By teasing the player with the knowledge that they could die during these scenes but NOT killing them, the game establishes a level of tension that increases as gameplay develops. The game stay fresh and unpredictable, and I was unable to keep my wits about me as I continued to survive the psychological horrors of Rapture. The Ilinx elements of the game kept me unstabilized and panicked during the conflict scenes, and I died multiple times to not being able to think clearly. I can’t wait to keep playing. 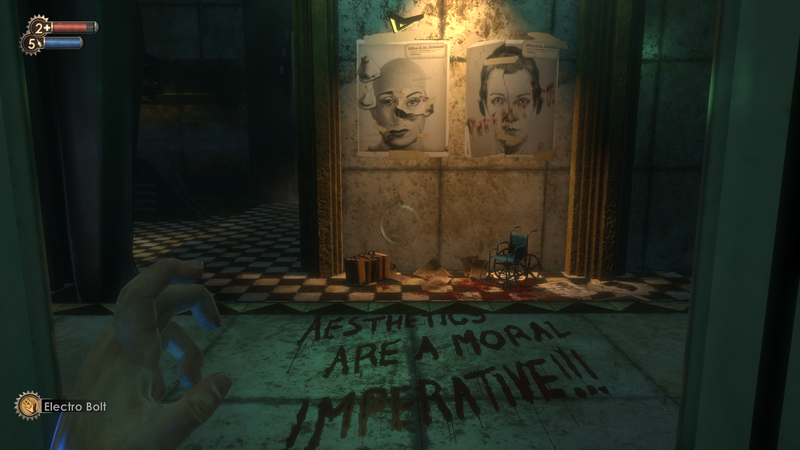 You do a nice job of describing the emotional and physical experience of playing, and the two guiding principles you’ve selected to explore (the magic circle and illinx as a category of game) are especially rich when applied to Bioshock. This would be stronger if you took a moment to quickly define your terms, and spent a bit more space critically applying them. These posts need to strike a balance between your experience, and your analysis of that experience, and this is too light on the latter. How, specifically, does the design and gameplay create and maintain the magic circle? What are the implications of describing playing Bioshock as an act of pleasurable physiological torture? You begin to explore these issues, you just need to tease them out in a bit more detail. Other minor notes: Great to see you include and directly reference relevant images in text. Have the same attention to detail with your citations going forward.